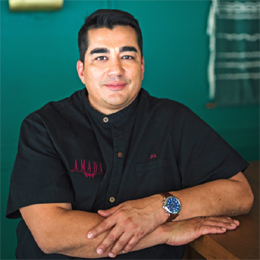 F or a man whose imagination stretches to include cuisines from across the globe in his restaurants, it is a marvel that Chef Jose Garces can simultaneously work as hard as he does to give back to his local community, Philadelphia. He has just opened two new restaurants—Olón and Okatshe—at the Tropicana Atlantic City. In addition to launching these two distinctly flavored eateries, Garces presented one of the Garces Foundation’s crowning events. On March 24, Garces presented his “Think Local, Give Local: An Evening Benefiting the Garces Foundation” at the Loews Philadelphia Hotel. The event—whose mission is to support the health, language, cultural skills and nutrition of the immigrant community in Philadelphia—featured a cornucopia of edible delights for guests to sample as well as cocktails and spirits, all with a local flair. Participating chefs included some of Philadelphia’s biggest culinary names from Peter Woolsey of Bistrot La Minette, Chip Roman of Blackfish, Jeremy Nolen of Brauhaus Schmitz, Townsend Wentz of Townsend to Greg Vernick of Vernick Food & Drink. 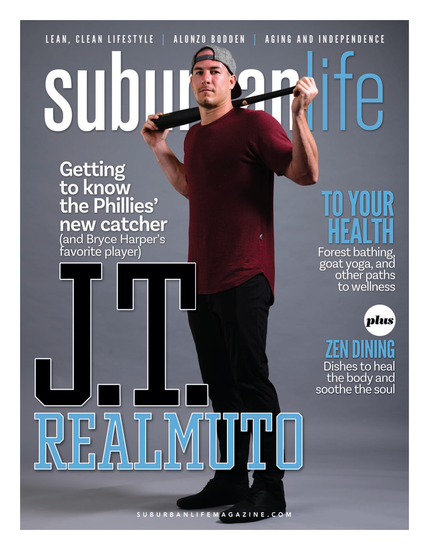 Garces took some time from his packed schedule to speak with Suburban Life/Philadelphia Life about the event, his two new restaurants and the importance—and timeliness—of giving back to the immigrant community. What inspired you to simultaneously open two very different style—Japanese Izakaya and Ecuadorian—restaurants? These are both concepts that have kind of been in my “bull pen” for a while in terms of waiting to put them out there in the world, with maybe at least another 10 other ideas, but these two are ones I’ve wanted to do for a while. I met with the folks at [Tropicana], Alan Ricin and Tony Rodio, who have been fabulous partners. The relationship has been so great from the beginning, but they gave me a bit of a blank check to really create something special. We walked into the old Fin space and there [are] beautiful views of the ocean [and] the beach and it kind of brought me back to my childhood visits to the beach in Ecuador called Olón. In Olón, there [are] basically a bunch of cabanas in which you camp out, there [are] great shacks and restaurants, there’s ceviche carp and so all those experiences of being here, brought me back there. ...Usually for me, a lot of times, it is about a memory or a travel experience—that kind of inspires my food. So that was really Olón. Then I traveled to Tokyo a few times—once in filming Iron Chef and the second time I just went back with my family because I enjoyed it so much the first time. There were just so many great food experiences that I’ve had—whether it was sushi, yakitori, ramen or other various small plates—those were all great food memories and I wanted to bundle them into one place. This venue seemed like the best spot to do it in. One of the things we’ve noticed with our restaurants in Philly, like for example Village Whiskey and Tinto, having the two concepts that are pretty different from one another really helps create like a buzz or an energy, or both restaurants kind of play off each other, so there was that thought to bring two ideas together. What will Olón and Okatshe have in common? Great seafood because we’ve got a number of great ceviches … raw bar items and then we have a great sushi/sashimi/maki program at Okatshe. You also held the Garces Foundation gala. What was the inspiration behind it? “Think Local, Give Local” had tastings from some of the area’s brightest chefs, the food [was served] at the Loews Hotel in Philly. … This is our fifth year in the foundation and we recognize immigrant communities as an essential part of the hospitality industry. Since 2012, the Garces Foundation has provided health, nutrition and education resources for immigrant families in need, so that’s really the core of it. My parents both emigrated from Ecuador back in the 1960s [and] I was born in Chicago, so it’s a topic that’s pretty close to my heart. It’s just an opportunity for me to give back or pay it forward. Do you feel the work of the Garces Foundation is particularly important at this point in history? I think it definitely is. There is definitely a feeling in the air that is happening. I consider the people I work with to be my extended family and I’ve always encouraged them to speak up because I feel it’s important to let everyone be heard and more than ever, it feels like that’s kind of … I don’t want to say ‘under attack,’ but it’s something that is important to me. It has been for a long time and I continue to support it. To learn more about the Garces Foundation and the gala, visit GarcesFoundation.org.